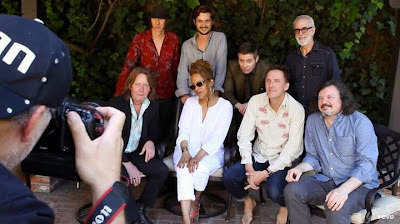 Cassandra Wilson and the rest of Team "Coming Forth by Day." Photo from Cassandra Wilson Facebook page. Audiences in New York, Boston, New Orleans and other cities are in for a treat if Cassandra Wilson's shows play out like “Coming Forth by Day” (Legacy Recordings). The record, released on 7 April and the centennial of the birth of Billie Holiday, pays tribute to that iconic artist. It is CW's second tribute album (“Traveling Miles”  was the first). “Coming Forth by Day” is jazzy, bluesy; it rocks; it swings. Moody and dramatic are apt characterizations. It can be described as ethereal. The two-time Grammy winner has said she wanted to do something atypical with her latest project. Certainly, many of her song choices don't typically make BH best-of lists. “We couldn't just revisit Billie Holiday and regurgitate the usual things that jazz musicians do. So all of the genres go out the window. All of those preconceived notions about how to approach a song go out the window.” (See video below). Importantly, she invokes the royal we and alludes to genre-breaking. Therein lies the success of “Coming Forth by Day.” It is produced by Nick Launay. The rows that this uber-producer, composer and recording engineer hoes are mainly in the pop-punk realm. Heretofore, jazz has not been his thing. The opening seconds of Track 5, “All of Me,” wash over the listener with a series of bell-like sounds, then possibly cymbals, followed by piano and base. Now, strings and all are speaking at the same time. It is deeply textured and coherent. Meanwhile, CW's contralto is being swept along by the sounds on top of, beneath and surrounding it. All conjuring up images of a lazy warm afternoon at the beach or an intimate dinner with friends; speeding along a deserted scenic coast in a sports car with the top down. NL brought onto this project artists with whom he's worked. From Nick Cave and the Bad Seeds came drummer Thomas Wydler and bassist Martyn P. Casey. He also pressed into service Yeah, Yeah, Yeahs guitarist Nick Zinner. “You Go to My Head (Track 4) opens with drums, followed by guitar, before the whole body kicks in, sounding very much like a full orchestra for a few seconds, before it crescendos down to one or two instruments. It would make a perfect musical backdrop in a stylized film, something on the order of a James Bond entry. CW's vocals kicks in at the 35-second mark. For these ears, Sarah Vaughan OWNS this song. It succeeds here, however, because along with the instrumentals, Van Dyke Park's (also on strings) arrangement is sublime despite its postlude. Though punctuated by sparkling repartee between base and violin, it is superfluous. Rounding out the musicians are CW collaborators pianist Jon Cowherd, guitarist Kevin Breit and saxophonist Robby Marshall. On 25 April, CW will be in concert at the New Orleans Jazz and Heritage Festival. She takes to the stage of Boston's Berklee Performance Center on 11 April. Like “Coming Forth by Day,” the concert is dedicated to the lady born Leonora Fagan. CW's decision to simply pay homage to Lady Day rather than imitate her was a wise one for two important reasons. First, their voices are so very different. BH's alto is in the spirit of a young, flirtatious girl – a minx. On the otherhand, CW's contralto is that of a sultry woman who knows what she's about. Regurgitation would have been strange fruit indeed. The vocal standouts on “Coming Forth by Day” are “The Way You Look Tonight” (Track 6) and “I'll Be Seeing You” (Track 11). Perhaps, this is the case because the vocals are front and center. On the latter, which opens with nearly 90 seconds of instrumentals, CW particularly takes her time, singing haltingly at moments. If “The Way You Look Tonight” suggests a woman sensing impending heartbreak, Track 11 presents one whose heart has been shattered, stomped on, then shredded. Her sorrow is palpable. 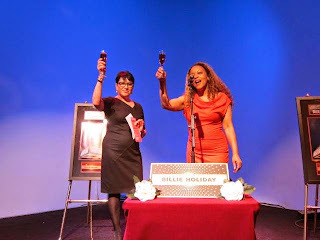 The Apollo Theater executive producer Mikki Shepard and Cassandra Wilson lead a toast to Billie Holiday in the Mainstage venue afer the singer's Walk of Fame induction ceremony. Photo by Karmyn Caraballo. The second reason eschewing a full-on BH imitation shows good sense is because the songs are classics, known to many and sundry. An imitator leaves herself open to unfavorable comparisons. One is hardpressed, though, to find comparisons between “Coming Forth by Day” and any other. CW still adheres to the M-Base Collective best practice of often thrusting instruments to the foreground and pushing voice to the background. The distinction as the most haunting track belongs to "Strange Fruit" (Track 10), not surprising considering its subject matter. It is the third best vocal performance from CW. The gravitas inherent in her voice is well-suited for her role here of chorus, expressing the horrors in this tragedy. A breakout hit for BH, "Strange Fruit" is another track on "Coming Forth by Day" that would seamlessly fit into a Bond flick. Likewise for Sergio Leone westerns and horror films starring Vincent Price and Boris Karloff. Musical genres – blues, European classical, jazz, pop, punk, rock, soul – soar and freefall, finally congealing like an accusing, angry mob. Noisy, bloodthirsty, terrifying. Expressed through instruments, this brutality is beautiful. The musicians should be given equal due for the simple truth that the instruments – not CW's vocals – drive most of the songs. The unexpected combinations of sounds that NL has wrested from these artists and VDP's arrangement of them are the ingredients that make “Coming Forth by Day” the triumph that it is. Listeners, close your eyes and allow yourself to be transported to some fantastic, unfamiliar places. 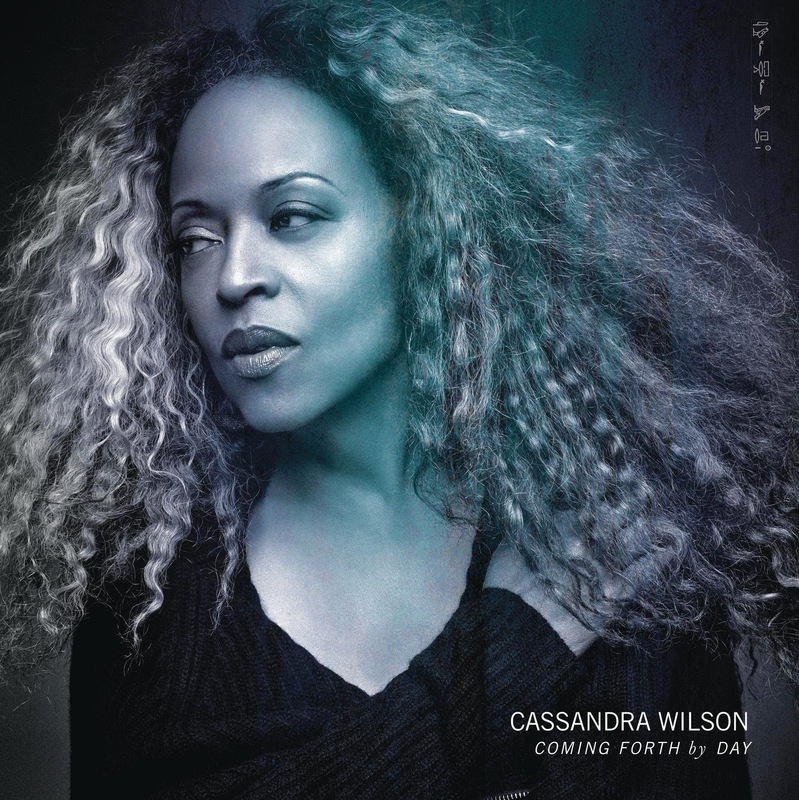 Visit http://www.cassandrawilson.com to purchase and learn more about “Coming Forth by Day” and for a tour schedule; visit http://www.bit.ly/1FINmK2 to purchase tickets and to learn more about "Absolutely Live Presents Cassandra Wilson: A Celebration of Billie Holiday."